FeatureMILL HSM also contains all of the options for rest machining, such as pencil machining and corner clearance, and high-speed machining, including trochoidal machining and Delcam’s patented Race Line Machining. It maximizes the benefits of any investment in high-speed mills with strategies that maximize machine productivity while protecting the part, machine and cutter from excessive wear. 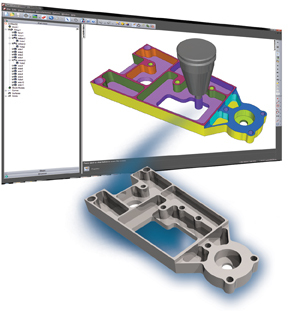 New options have also been added to give smoother five-axis machining. A new look-ahead capability will remove any sudden tool-axis changes during automatic collision avoidance and, instead, ensure that a smooth transition takes place. In addition, FeatureCAM now offers the ability to smooth the Azimuth and Elevation axes independently and so remove excessive five-axis movement. These options stabilize the rotary axis movement by maintaining a fixed tool axis as far as possible, thus replacing constant five-axis movement with a series of 3+2-axis segments having full five-axis transitions between them. The options for multi-spindle, multi-turret machines have been improved by fully integrating part transfers into the FeatureCAM output. Simulation and post-processing of these operations is also supported. In addition, the handling of synchronization points has been enhanced to simplify the optimization of the machining sequence between the various elements of the machine.